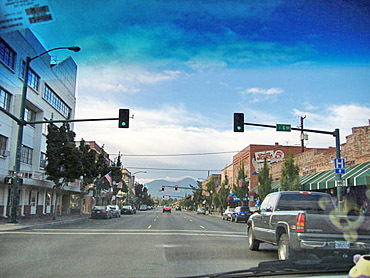 Grants Pass is located in Southern Oregon about 60 miles north of the California border. It is a town filled with beauty, history and scenic attractions. 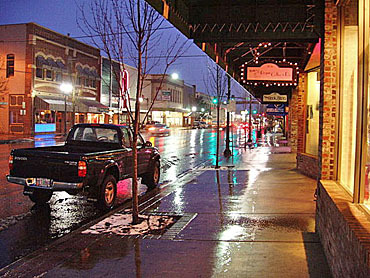 Downtown Grants Pass has earned the distinction of a National Historic District because of its historic buildings and homes. The city is filled with antique and collectible shops, ice cream parlors, and sidewalk espresso stands. Be sure to stroll through downtown and enjoy the beautifully restored historical buildings. The highlight of Grants Pass is the mighty Rogue River flowing through town. Riverside Park is located right on the Rogue River and is a wonderful place to picnic and walk along the Rogue. The city is often referred to the "whitewater rafting capital" of Oregon and over 25 outfitters offer rafting adventures in Grants Pass and nearby Merlin. There are jet boats that leave from Grants Pass and take visitors on a tour through Hellgate Canyon. Be sure to bring your cameras to catch the extensive wildlife on film. In 1968 the Rogue River was designated by Congress as a National Wild and Scenic river. Visitors have access to an unspoiled wilderness world! 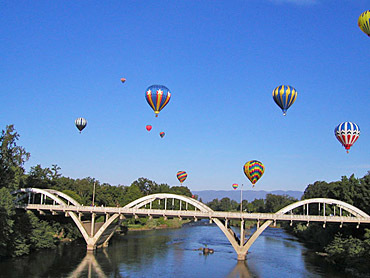 Grants Pass abounds with modern campgrounds and RV facilities, many with boat ramps and riverside campsites. Josephine County has an extensive system of parks, and many of these are on the Rogue River. As far as lodging, you will find quality Hotels, Motels, B & B's and Inns. Historical Sites - Enjoy a walk through time as visitors and residents share the legends of Historic Grants Pass. Visitors will enjoy a tour of our Pioneer Cemetery Memorial Drive, visit historic homes of The Croxton House, The Alf House, The Judson House and our famous Schmidt House. Visit the Schmidt House located on SW 5th Street, downtown, for a tour of Josephine County's Historical Society. Contact 541-479-7827 for tours. For a complete list of historical residences, ask for maps on our Walking Tour of Historic Grants Pass. Amazing May is the season opener. Festivities are scheduled throughout the entire month of May. Events include the Native American Arts Festival; Spring Wine Stroll, Antique & Collectible Street Fair, Boatnik, the Wild Rogue Balloon Festival (verify this), and many more. For a list of May events call 1-800-547-5927 for further information. Art Along the Rogue A premiere fall event. This unique event introduces an art and music festival at its best, introducing nationally-known and local pastel street artists along with local and regional musical entertainers and art displays, in an event that promises to be as inspiring as it is fun. This three-day event is a must see! Call 1-800-547-5927 for more exciting details. The Fabulous 50's Car Show is a summer event not to be missed. Celebration includes a downtown 50's car cruise, a dance, live music and much more for the entire family to enjoy. Bear Fest in Grants Pass, Oregon, is a celebration honoring the area's most prized inhabitants - the black bear. Our bedecked, larger-than-life bears start out as plain fiberglass figures. They are then magically transformed by local artists into colorful, embellished creatures that are publicly displayed on the downtown streets for all to see, touch, and enjoy throughout the summer months. Besides its obvious entertainment value, Bear Fest was organized to raise funds and support for nonprofit organizations in Grants Pass. There are sixty-two of the wildest bears you are likely to encounter. Larger than life-size bears, artfully interpreted by local artists as fun and friendly public art, are displayed on the streets and sidewalks of beautiful downtown Grants Pass. Each of the designed bruins include an adorable "bear cub" as a companion. Boatnik is an event for the entire family to enjoy memorial weekend. The event is kicked off by a parade terminating in Riverside Park, the starting point for whitewater hydro boats racing 35 miles down the Rogue River and back. Activities in the park include magic and art shows, crafts, art, clothing and food vendors. Call 1-800-547-5927 for further info. Concerts in the Park is a great setting for a family picnic! Annually this event provides a unique variety of local music performances free to the public. Limited food vendors, beverages and other snack treats for the kids are available throughout the concert. Every summer from July to August performances will take place every Tuesday evening starting at 6:30pm at Riverside Park. Contact 1-800-547-5927 for more information and concert performers. First Friday Art Night Enjoy an evening stroll through downtown Historic "G" and 6th Street viewing a variety of local talents in our art Galleries and Museum. Occurring on the first Friday night of the month (excluding January), Grants Pass comes alive with music and art. There are various shops, galleries and restaurants open late displaying local art and musical talent. Event begins at 6pm and ends at 9pm. Performing Arts - Grants Pass offers a uniquely diverse selection of performing art theatres varying from treasured Musicals to favored Comedies along with remembered Documentaries & the exploration of Modern performances. Reminiscing favorite Broadway style shows, enjoying invigorating community youth productions, to reliving audience involvement plays. Grower's Market - "We grow it, cook it, and make it, just for you" - Rising above Oregon's only permanent open-air agricultural market, one hears many languages; Spanish, German, Japanese, Russian; all boasting of the bounty of Southern Oregon. Providing our families with a wide variety of specialties, the atmosphere is relaxed, festive and fun. Discover Grants Pass Growers Market. Open Mid March to Thanksgiving, Saturdays from 9am - 1pm & June to September on Wednesdays at Riverside Park from 9am - 1pm. Contact 541-476-5375 for further information. 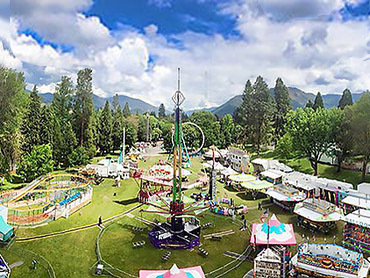 Josephine County Fair is held in mid- August and is a great summer event. This old-fashioned county fair includes baking, crafts, and hobby contests along with livestock auctions, entertainment, carnival rides and even pig races. Magical Musical Holiday Murals These holiday murals light up Grants Pass along both 6th and 7th Street annually, mid November to December 31st. Donated by the fine works of Fiber optic Lighting, 20 murals decorate downtown, each 5ft x 10ft uniquely designed giant holiday card, weighing 400 pounds, specializes in its own sound system along with playing its own holiday tune. Who says you can't stroll through downtown Grants Pass during the holidays listening to Jingle Bells? Medical Services - The Three Rivers Hospitals are full-service, community owned health care facilities. Three Rivers offers an array of services not usually found outside of metropolitan areas. Included in the hospital's services are a homelike birthing center, the area's only maternity service and American Medical Response, the hospital' critical care ambulance. Medical specialties currently represented on the medical staff of the hospital include: allergy, dentistry, dermatology, emergency medicine, family and general practice, Hospice Care, home health, infectious diseases, internal medicine, neurology, obstetrics/gynecology, occupational health, ophthalmology, oral/maxillofacial surgery, orthopedic surgery, osteopathy, otolaryngology, (ear, nose and throat), pathology, pediatrics, psychiatry, radiology, surgery (colon-rectal, general, thoracic, and vascular) and urology. If you are new to our area, or would like to be referred to a doctor, please call the Physician Referral Service. Schools - There are 10 elementary schools, a number of private, parochial, independent, vocational and pre-schools. Three middle schools, three high schools, and Rogue River Community College are also available in Grants Pass. Southern Oregon State College, a four year institution, is located in Ashland. Churches - More than 77 churches in Josephine County represent a majority of denominations. Transportation - Josephine Community Transit 541-474-5452 offers a city bus route and taxi service. Greyhound has a terminal on Agnes Ave as well as one at the Grants Pass Airport, which has a small airstrip near Merlin . The City of Grants Pass is within 30 minutes of a major air terminal in Jackson County which serves both counties. An industrial-business-recreational airport in Merlin is five minutes from Grants Pass. Note: SouthernOregon.com does Not provide Info, directions, dates, fees to any of the above by phone or email.